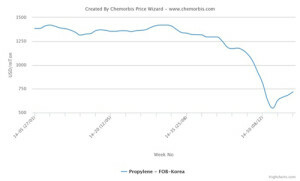 According to ChemOrbis, spot propylene prices in Asia have been steadily firming up since late December after having hit a more than 5 year low. Even though this rebound was first interpreted as a short-term correction following the hefty losses of the previous 5 months, it has been four weeks since spot prices have been rising, posting a cumulative increase of a little more than $170/ton on average on FOB South Korea basis. When it comes to the reasons behind this recent rebound, first and foremost, buying appetite has resumed in China ahead of their New Year holiday to be celebrated on February 18. 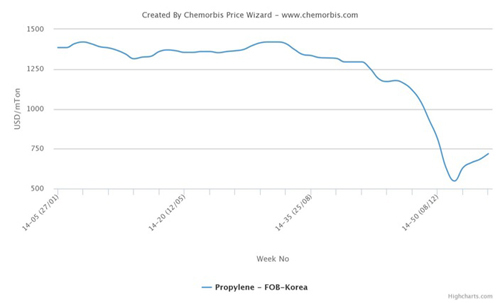 As buyers were left with low stocks because of the previous decreasing trend which discouraged purchases, demand for prompt propylene is reportedly high, according to players. Maintenance shutdowns in South Korea also reduced availability in the region, triggering supply concerns amidst a rebound in buying interest. South Korea’s Hyosung Corp’ s PDH unit with 200,000 tons/year capacity in Ulsan was shut on January 6 for scheduled maintenance. Taekwang Industrial also shut its PDH unit, which has the capacity to produce 250,000 tons/year of propylene. Players also reported that buying interest has shown an improvement from Taiwan, where CPC has been experiencing some issues at two of its plants which produce propylene. Nevertheless, some players are still taking these increases in the propylene market with a pinch of salt particularly when crude oil remains bearish. Although crude oil futures pared some losses in the past week, they turned downwards again this week upon a new series of reports. Moody’s lowered its assumptions for crude oil for 2015. The fact that Iraqi crude production surged to a record and the International Monetary Fund (IMF) cut its global growth outlook also contributed to the downward trajectory of crude oil this week. The recent news that China’s GDP growth is the lowest of the past 24 years was another factor backing the weak atmosphere, according to ChemOrbis. It is a question mark how long spot propylene prices can sustain this firming path when crude oil remains bearish, argue players. They also underscore that this buying interest will wane ahead of the holiday and the rebound will be short-lived.